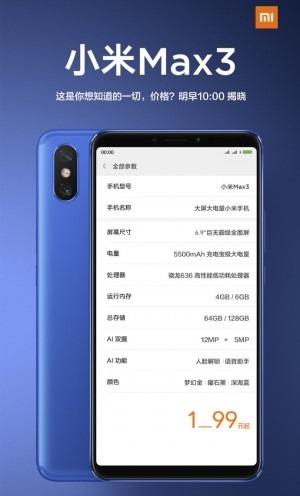 The Xiaomi Mi Max 3 will be officially announced on 19th of this July but just before then, the full specifications of the device has been outed by Lin Bin, hereby spoiling the surprise package Xiaomi was readying. He posted official renders of the Mi Max 3 yesterday and it seems that wasn’t enough, he went further ahead to divulge the key specs of the device. 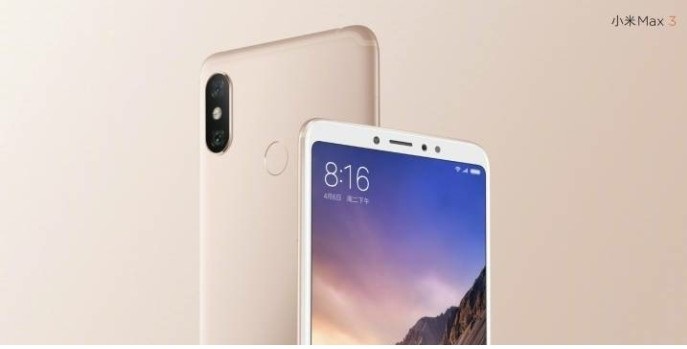 According the leaked render, Xiaomi Mi Max 3 is coming with a Snapdragon 636 chipset and a combo of 12 MP and 5 MP for rear camera. 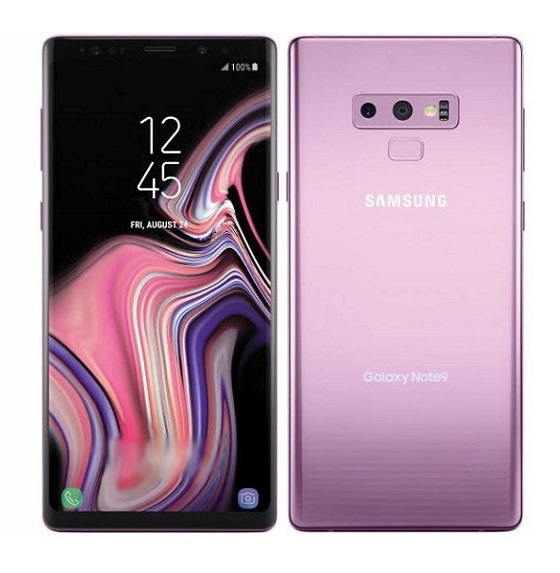 We were already aware the device will have a 6.9” LCD panel after the company revealed this via their account on Weibo back in Monday. 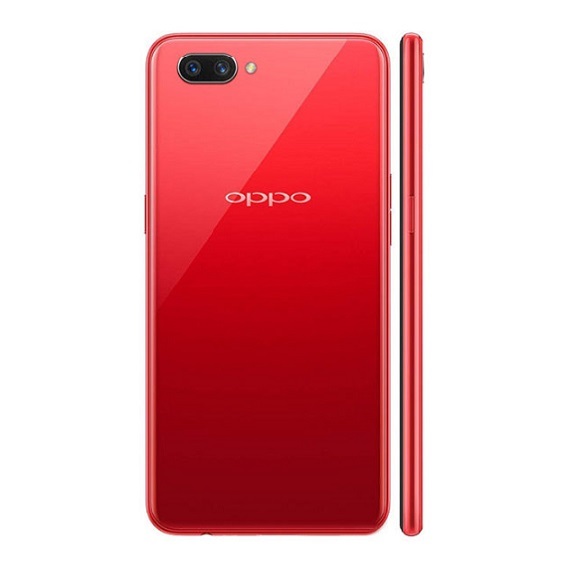 The post also revealed the battery size which will be the biggest in the series so far, harboring a 5,500 mAh battery. 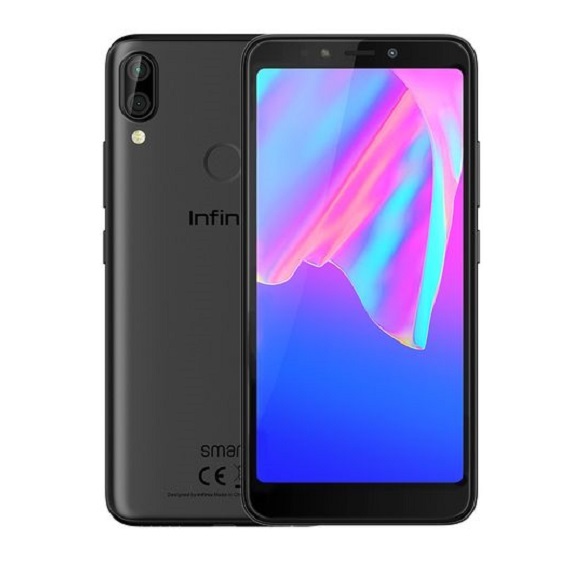 The device is purported to come with Android 8.1 Oreo with the company’s MIUI skin on top, screen resolution is set at full HD+ (2160 by 1080 pixels). 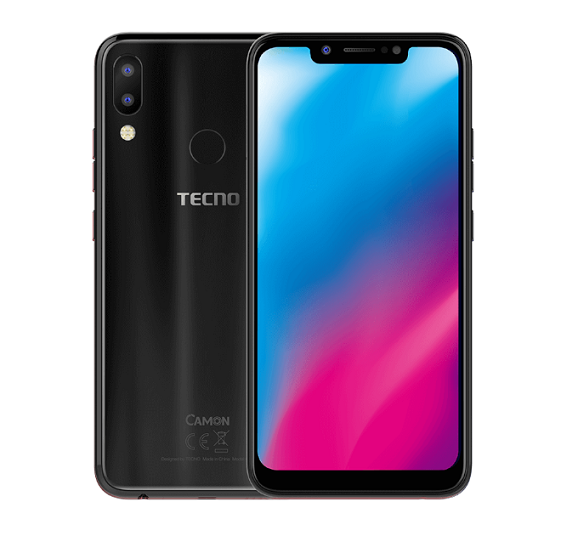 The dual camera on the back is typically the same setup as the one we saw on Redmi Note 5, while the selfie shutter sees 8 MP lens. 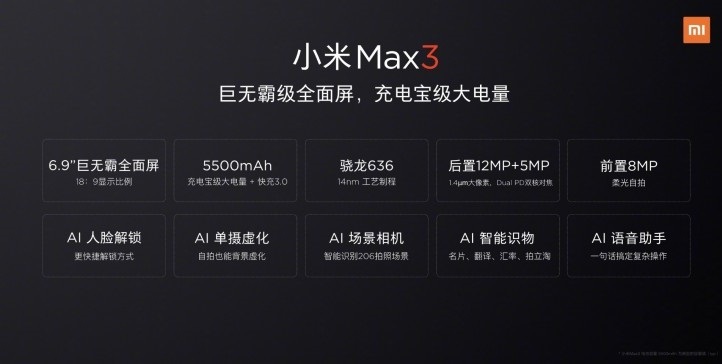 Also revealed from the image, on the second row, Xiaomi Mi Max 3 will be heavy on the AI (Artificial Intelligence). The trendy feature will be implemented in the Face Unlock. 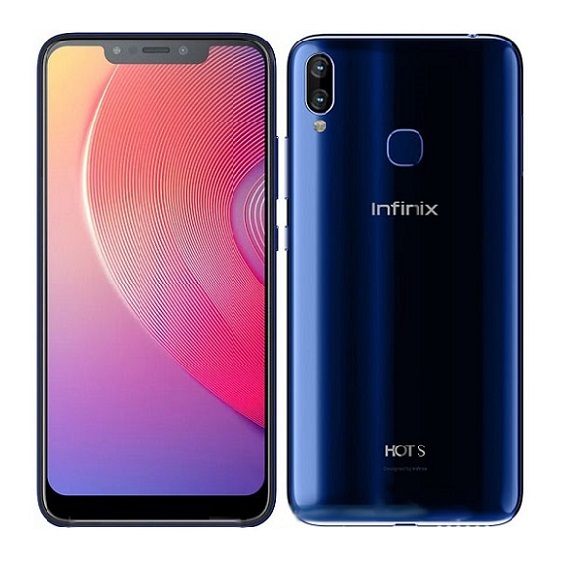 Remember we’ve seen the likes of Infinix Note 5 and Note 5 Pro come with the AI to spice things up in the mid-range category. It will also learn throughout time how to accurately create a background blur when shooting with the camera. Speaking of taking pictures, the UI now reads and adapts to at least 206 different scenes and there is also an AI voice assistant. While leakster is only revealing some part of the specifications, the official Xiaomi account is announcing the rest – the Mi Max 3 will have 4/6 GB RAM and 64/128 GB storage, but does not reveal the configurations. 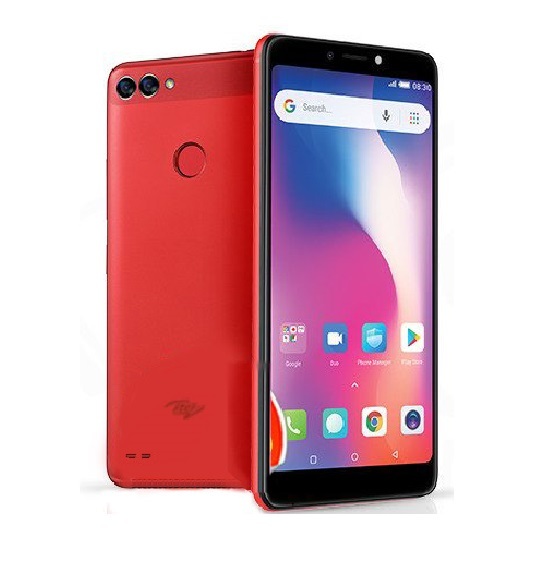 The price is hinted as CNY1_99 and even if its CNY1999, the phone will be less than $300/€260 which translates to around N108,000 in Nigeria.